The Advertising Standards Authority has upheld a complaint by Ryanair against its rival EasyJet after they made a claim in an advertising campaign that claimed that the Irish competitor did not fly passengers “to the place you actually booked”. 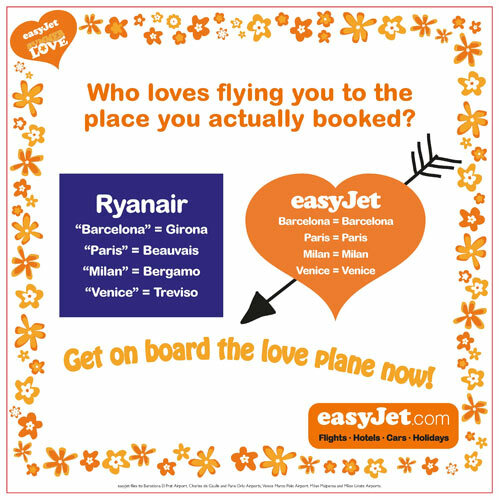 The poster, which appeared on a train, suggested Ryanair flew to airports in the proximity of the cities promoted as destinations; but Ryanair successfully argued that the ad was misleading as it implied people would not fly to the city they booked to whereas the advertising and website made clear where the airline flew to. Upholding Ryanair’s complaint, the ASA said: “While we noted EasyJet’s argument that the ad was merely a comparison between airport locations, we were concerned that by listing the airports which Ryanair flew to but only referring to the ones EasyJet flew to in much smaller print at the bottom of the ad and by not giving any data which readers might use to make an assessment of the facts, the ad did not achieve that end. EasyJet UK general manager Paul Simmons said: “It is a well-know fact that EasyJet flies to major airports whereas Ryanair serves out-of-town airfields which can be a two hour bus ride away from your destination. It’s rather ironic that Ryanair had to turn to the ASA to use the very same codes of conduct that in previous years they have had disputes over. Murcia airport is going to be hit now by the pull out of Ryanair during the winter months to dozens of UK destinations. Not only that but all of the local businesses and holiday makers are going to be affected. If you fly on RyanAir to Oslo, you end up in Torp, which is actually a hell of a bus ride away (and the journey costs 30 Euros or something I seem to remember)… So there’s at least some merit in EasyJet’s ad I think!